Fosse Meadows Farm is set in the rolling green fields of North Kilworth, Leicestershire – the poultry farm started close to the Fosse Meadows nature park, to which the farm owes its name. It’s a fourth generation farm producing free-range and very slow-grown poultry using traditional, organic and compassionate methods, to produce the very best bird using the highest welfare. 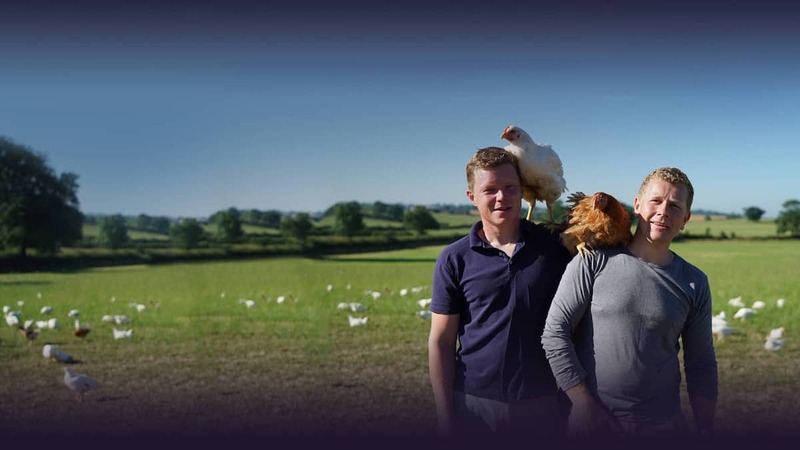 Owners Nick Ball and Jacob Sykes returned to the Ball’s family farm in Leicestershire to start the poultry farming business after living in ‘Peck’em’, London – as a fashion designer and property developer respectively. Nick and Jacob’s keen interest in good food meant their aim was to produce something a bit different – a bird they were both happy to say was of the highest quality, of excellent flavour and succulence, and raised organically using compassion and artisan farming standards. Fosse Meadows Farm produces free-range, slow-grown chickens all year round. The traditional French breed chickens are slow-reared to full maturity, (to 81 days), with access to mobile sheds during the daytime when bad weather occurs and overnight for protection from foxes. They are fed an additive-free corn-rich diet with full access to green pastures and wild flower hedges, roaming freely, scratching around in the clover fields and at the bottom of trees and hedges. Fosse Meadows chickens won a Good Housekeeping award in 2015, have numerous recommendations from chefs and food writers and came top in a blind taste test by a Michelin starred chef. 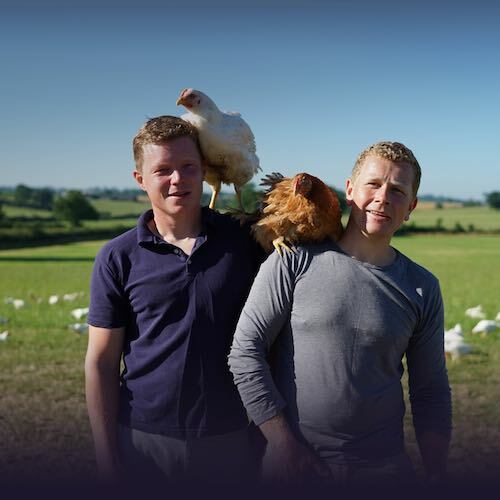 Nick and Jacob also produce seasonal bronze free-range turkey, geese and cockerels, which are reared with the same slow-growing and compassionate principles. Their membership of the Traditional Farmfresh Turkey Association means the free-range bronze turkeys are grown to a high independent standard, one that they uphold for its principles of welfare, quality and artisan methods to ensure the very best turkey for Christmas.